Richard Allen “R.J.” Umberger, Jr.
Hey, it’s a Pittsburgh boy! As a teen, he attended Plum High School and led the hockey team to the Penguins Cup (the championship cup high school hockey teams play for in western PA) before heading to Ohio State University. He was drafted 16th overall by the Vancouver Canucks in 2001, and he left OSU before his senior year, thinking he’d turn pro. That didn’t work out, so he sat out the 2003-04 season. Then he was traded to the New York Rangers but signed as a Free Range Hockey Boy with the Philadelphia Flyers; of course, this was before the Year That Never Was, so he played with the Philly Phantoms that year – even helping them win the Calder Cup – before being called up to play with the Flyers. Trying to slip one past Kari Lehtonen. 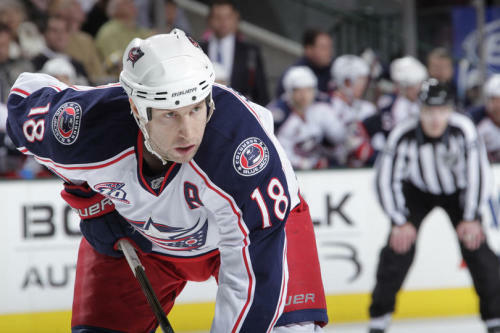 In 2008, he was traded to the Blue Jackets for a draft pick (using the Avs as a middleman of sorts) and earned 20 goals toward his 46 points in the 2008-09 season. The best part about that season? He scored the Jackets’ very first playoff goal in their only appearance (so far) in 2009. This past season saw him play every game and score 25 goals out of 57 points. The Jackets re-signed him in September to a five-year extension, so fans in Columbus will see him on the ice for quite a while longer. Guys, don't fight over whose MotD profile is better!